FINN TRU-Mulches are produced from high quality virgin poplar and pine wood chips, blended with clean, recycled paper products, for use in hydroseeding and erosion control applications. 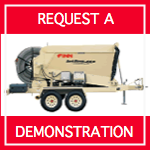 All FINN TRU-Mulch products are produced using an advanced “Double Refining” process, whereby high pressure steam is used to soften the wood chips before they are put through a second process that refines the chips into the long fibers required for effective mechanical cross-linking. Product is blended with environmentally safe, non toxic dye that holds brighter color longer. We have taken three additive products (Finn HG, Finn HST, FinnMB) and added moisture retention surfactants to create Finn HydroMax. This combination of materials, correctly proportioned in each 2.5-gallon container simplifies the Additive System. Now each 5 gallon case will cover one acre of hydroseeding, all you have to do is shake and pour. Finn HydroMax consists of natural plant growth hormones and vitamins, which stimulate earlier germination and root development. The beneficial bacteria and microbes are effective in areas where the soil has been exposed to high levels of enviromental/mechanical stress that suppresses the natural microbial functions in the soil. Soils and substrates associated with denuded sites from construction, mining, energy development and other land disturbing activities are inherently lacking in organic matter, nutrients and biological activity essential to sustainable vegetative establishment. Ideally these sites would be covered with several inches (centimeters) of rich fertile topsoil to help develop a reasonable growing medium. However, there is simply not enough suitable or reasonably priced topsoil to ameliorate inhospitable conditions on every site. Patent-pending ProGanics™ Biotic Soil Media™ (BSM™) has been designed as a topsoil alternative that accelerates the development of depleted soils/substrates with low organic matter, low nutrient levels and limited biological activity. ProGanics is not a direct replacement for expensive topsoil, but provides an abundant source of organic matter and soil building components to quickly modify soil chemistry, initiate growth establishment and buildup of the uppermost “O” and “A” soil horizons. Unlike peat harvested from fragile wetlands, all components of the ProGanics Biotic Soil Media blend are naturally derived and renewable, and engineered to optimize moisture retention, growth and establishment of vegetation. Request a free trial and see for yourself. Applying ProMatrix™ EFM™ or Flexterra® HP-FGM™ over ProGanics will provide near perfect erosion control. FiberPlus is a synthetic fiber that makes mulch hold better when applied. FiberPlus binds the mulch fibers together, and also helps bond it to the soil. FiberPlus provides better germination conditions for the seed, and also prevents mulch from washing away. FiberPlus will improve the results of every seeding job, and it is especially effective when seeding on slopes, or shielding seed from heavy rains. 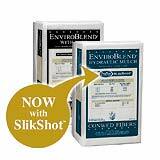 Conwed Fibers’ EnviroBlend® and EnviroBlend® with Tack combine 100% Thermally Refined wood fiber with the highest quality cellulose mulch in the industry. * Delivers up to 15% greater yield to contractors versus competitive blend products. * Covers up to 20% more ground than cellulose and provides superior erosion control and more complete germination without a big jump in price. * Now with SlikShot for better yield, less hose clogging and better ground coverage. * Same quality wood and cellulose blend as EnviroBlend but with a pre-blended 3% polymer tackifier for a stronger bond and added holding power. * Eliminates the extra step and mess of field-mixing tackifier. Absorbs 3 times more water than excelsior blankets and 4 times more water than straw blankets to accelerate seed germination for faster turf establishment. Weighs 50% less than excelsior blankets for easier installation with fewer man hours per square yard. Completely bio/photodegradable so there’s nothing to pick up after the job. HYDRO SWEET is a water soluble, water based solution specially formulated to neutralize acid soil conditions, sweeten soil, increase the amount of exchangeable calcium in soil and create a better environment for healthy plant growth. HYDRO SWEET is quickly and easily applied. It provides much more uniform coverage and is absorbed into the soil almost immediately, producing muchfaster and more readily visible results. Can be applied by hydroseeder, sprinkling can, hose-end sprayer or by injecting into sprinkling systems. FINN HydroGel® B is a polymer that is able to store water and nutrients up to 500% its own size and weight. Once HydroGel® B releases its stored moisture and nutrients to the root system, it will replenish itself with the next rainfall or irrigation. FINN HydroGel® B is a plant watering aid used to reduce or eliminate stress caused by a lack of moisture. 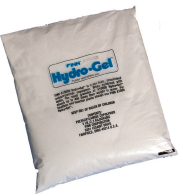 HYDRO TACK is a formulation for hydroseeding that is biodegradable to bind wood, paper, hay and straw fibers. • biodegradable and non-toxic when used as directed. • a granular powder that can be stored without freezing under adverse temperature conditions. This product is a multi-purpose additive for use as a fiber mulch stabilizer, for straw and hay mulch tacking and as a slurry lubricant. Flexterra™ uses patented technology combining both chemical and mechanical bonding techniques to lock the engineered medium in place. Crimped synthetic fibers, organic fibers and performance-enhancing additives form a lofty, interlocking matrix that creates air space and water-absorbing cavities which improve germination; reduce the impact of raindrop energy and minimize soil loss. Superior chemistry means no cure time, which enables the matrix to handle higher rates of surface flow energy from heavy rains—upon application. Water-resistant tackifiers and flocculants chemically bond the matrix to the soil surface. FGM™ has been used on projects ranging from rough ground and steep, rocky slopes to moderate- or steep-graded fill slopes. It is also used in environmentally sensitive wetlands and other wildlife areas not compatible with nettings.